Mobile learning, also referred to as mLearning, is taking center stage as one of the preeminent ways to provide training and development in a corporate environment. With the pervasiveness of mobile phones and tablets, it’s actually not just preferred – it’s often the only way employees are willing or able to complete training. Mobile learning and the development of coursework that’s going to work in this format is different from eLearning in general. With this in mind, it’s important to understand the scenarios where mLearning may work best for an organization. 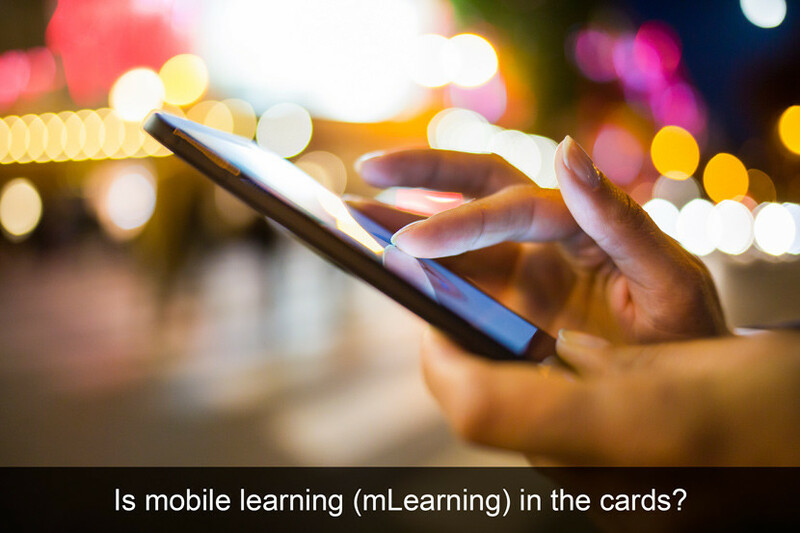 mLearning can be a great complement to classroom and instructor-led training. It can be used in any number of ways from providing a recall resource for learners after training is complete, to a tool to deliver social-based learning. You can also lay the initial groundwork for instructor-led training by providing students with the information they’ll be learning in the classroom beforehand. You can provide the objectives and goals of the classroom training they’ll be participating in, which is a great way to get them more engaged in the process. mLearning can provide opportunities for continual learning and development beyond the classroom, including the implementation of different multimedia tools from blogs to videos and podcasts. Mobile learning is ideal for training when employees travel a great deal or are located in broad geographic locations. For example, if you have traveling sales people or a fleet of drivers that you want to train, classroom and even computer-based training may not be an option, so mobile learning can deliver this content. If you’re planning to deploy mobile learning, there are some best practices to ensure your learners are engaged. Byte-sized content is of the utmost importance when it comes to presenting learning for a mobile device. We frequently discuss the importance of delivering short chunks of content, and while this is the optimal way to provide training in an eLearning format, it’s a necessity in mobile learning. Your learners primarily using their mobile devices are likely to need to access information on-the-go and keeping content concise is best. Take advantage of unique opportunities for interactivity. You can include social and real-time components in your mLearning that will let everyone get engaged and feel like they’re almost part of a classroom experience – for example, creating a poll where respondents answer via Twitter. It’s live, exciting and will keep your mobile learners more involved. Keep security as a top priority. Security is important with any type of multimedia learning, but this becomes even more true with mLearning. Choose a learning management system provider like eLeaP that does all of the necessary security work for you so you have peace of mind knowing your learners and your company are secure, even with learning taking place across a broad spectrum of devices and locations. Gamification is extremely valuable with learning delivered through a mobile device. Think about how often you see people playing games on their phone or tablet – it’s that addictive mentality that makes gamification so engaging in terms of learning. As far as functionality, don’t design training content that’s going to require your user to input a great deal of text. This isn’t really ideal on a mobile device, so try to stick to components like drag and drop or simple selection versus requiring extensive typing. Does your organization use any form of mLearning, either as a stand-alone training tool or as a complement to another type of learning and training? If so, how has it been beneficial?